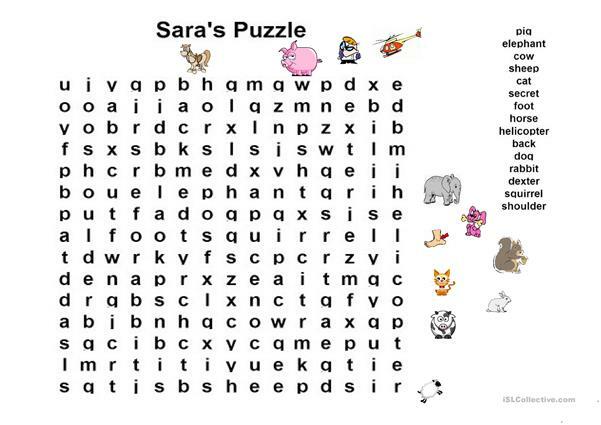 Word search puzzle with a combination of simple and complex but fun words, It includes both pictures and images as clues. The above downloadable teaching material was created for elementary school students at Elementary (A1) level. It is great for consolidating Nouns in English, and is excellent for working on your learners' Reading skills. davekovaka is from/lives in United States and has been a member of iSLCollective since 2013-01-28 01:12:09. davekovaka last logged in on 2013-01-28 02:26:36, and has shared 1 resources on iSLCollective so far.